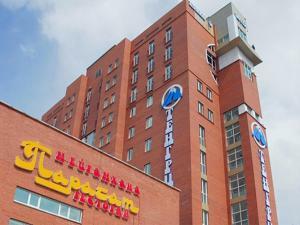 Comfort Hotel is conveniently located in the popular Astana area. Both business travelers and tourists can enjoy the hotel's facilities and services. All the necessary facilities, including free Wi-Fi in all rooms, Wi-Fi in public areas, car park, room service, airport transfer, are at hand. Designed for comfort, selected guestrooms offer internet access â�� wireless (complimentary), air conditioning, heating, desk, mini bar to ensure a restful night. Enjoy the hotel's recreational facilities, including fitness center, sauna, spa, massage, garden, before retiring to your room for a well-deserved rest. Convenience and comfort makes Comfort Hotel the perfect choice for your stay in Astana.